Model AFW-1 Automatic Self-Cleaning Strainer - S.P. Kinney Engineers, Inc. The Model AFW-1 is S.P. Kinney’s light-duty Automatic Self-Cleaning Strainer. The Model AFW-1 is designed for operation where the pressure 20 psi and up. The strainer employs the use of a stationary wedge wire drum and a rotating cleaning shoe. 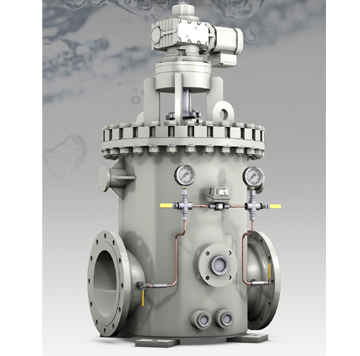 The “Model AFW-1” is a light duty strainer designed for continuous removal of suspended particles from all types of liquids. Applications are in industrial plants using river, lake, well or sea water for cooling, descaling, bearing lubrication, spraying, quenching and similar purposes. Pipeline size: 2”-48”. Liquids other than water, such as chemicals, acids, white water (paper mills), sewage plants, and ammonia ﬂushing liquor (coke plants) can also be eﬀectively strained. Installation is made on the discharge side of a pump or in any piping system operating under a positive pressure. The minimum working pressure required to eﬀectively clean the straining media is 20 psi. The strainer is compact with small face-to-face width and height dimensions. Installation can be made in a horizontal or vertical pipeline. 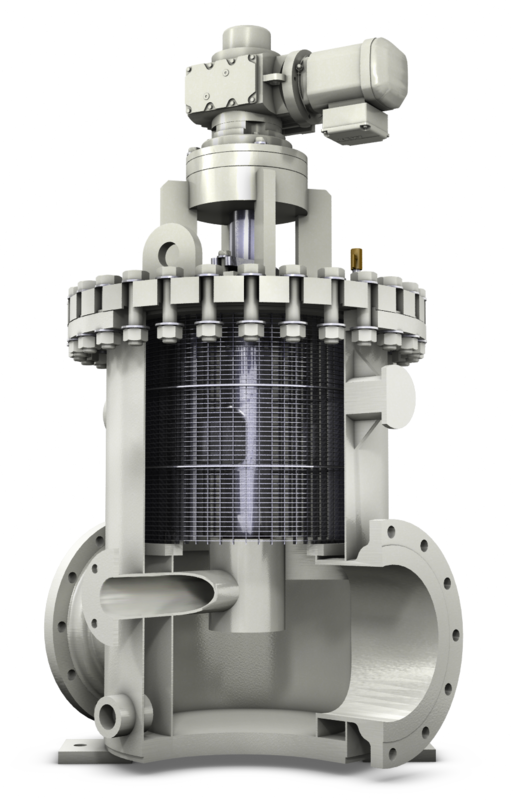 Similar to many of the automatic strainers on the market, the Model “AFW-1” consists of a one-piece stainless steel cylindrical well screen drum with slotted openings ranging from .005” through .075”. 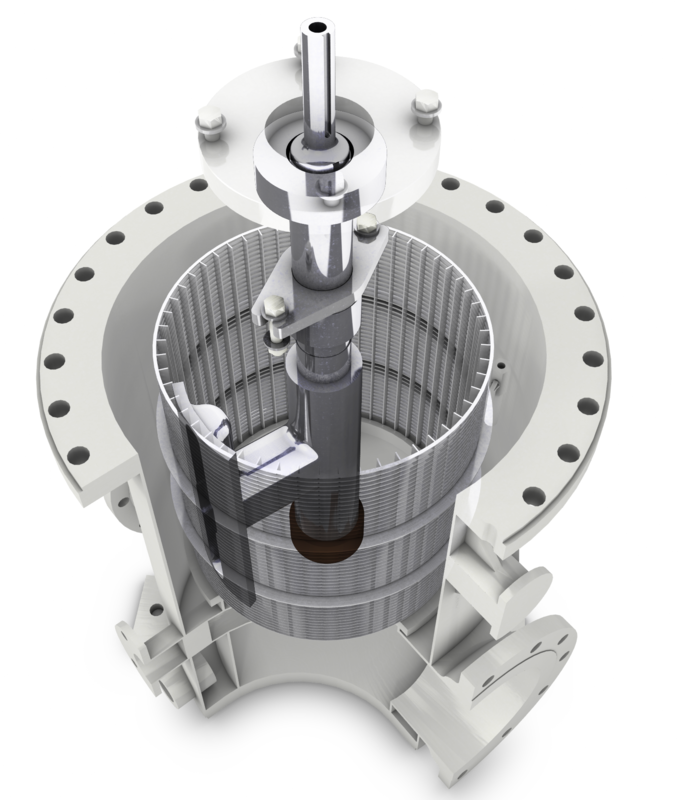 Within the drum is contained a rotor, which is essentially a hollow rotating shaft–supporting two pads extended on each side. These pads are ﬂush with the inside of the drum surface. The liquid to be strained enters the inlet connection located in the lower portion of the body and ﬂows upward into the inner surface of the drum. The suspended particles are retained, and the clean water can then continue through the outlet connection located diametrically opposite the inlet. As the rotor sweeps over the drum, a reversal of ﬂow occurs, ﬂushing the suspended particles from the media into the rotor and out through the backwash opening. This reversal of ﬂow is caused by a pressure diﬀerential between the interior of the strainer and the atmosphere. The backwash ﬂow rate is exceptionally low and will vary, depending on the amount of the suspended particles in the liquid. The backwash piping should discharge downward into an open funnel immediately after the backwash valve. In lieu of a manually operated backwash valve, an automatic control can be furnished to permit intermittent backﬂushing. This control consists of an electric or pneumatically operated ball valve, actuated by a timer or a pressure diﬀerential switch (or both).